It seems clear that what Pearcey says is true–the topic of worldview is gaining interest among Christians. I consider this a positive development, for when we understand worldview, we are better equipped to understand both ourselves and the culture we inhabit. 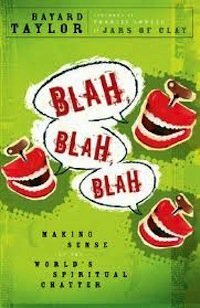 Bayard Taylor’s Blah Blah Blah is a book dedicated to worldview, and one aimed squarely at the teen and college crowd. And what is worldview? It is a word derived from the German word weltanschauung which means “look onto the world.” It describes, quite simply, a way of looking at the world. Every person has a worldview, which acts, according to Pearcey “like a mental map that tells us how to navigate the world effectively.” A worldview can be derived from any kind of ideology or influence. It can be Marxist, Darwinian, postmodern, biblical, or just about anything else. Taylor says, “Your worldview is your frame of reference, the spectacles through which you see the world. Worldview is the biggest determiner of human behavior. You might say you believe on way, but your real worldview is revealed by what you do.” Later he writes, “I’ll be using the word worldview to speak of people’s understanding of what is ultimately true and real about (1) the spiritual world, and (2) what it means to be human in this real world.” He lists five points that are true of all people: 1) Not everybody has a religion, but everybody has a worldview. 2) A worldview begins with a set of assumptions that can only be taken “by faith.” 3) Worldview assumptions are rarely acknowledged openly, questioned or challenged by those who hold them. 4) No worldview is totally open-minded; every worldview forces some narrowing of the mind. 5) Every worldview has strict and inflexible rules, or Absolutes, that must never be broken. And, on the whole, I think Taylor does a good job. Worldview is not my area of expertise, but I do feel that he covered the topics well and did a good job of defending a biblical worldview. In fact, my only real critique would be that his understanding of “Christian” may be a good deal wider than mine. Thus his understanding of what can constitute a biblical worldview would also be wider. Still, this is seen in only a few short paragraphs and does not detract a great deal from the book. Written and presented in a way that will appeal to teens and college students, but will not drive away adult readers, Blah Blah Blah covers an important topic. This book will equip Christians, and primarily young Christians, to deal with the culture around them. It will help prepare Christians both spiritually and mentally to face a world that is increasingly post-Christian.